With the nod of approval having been expressed by some nations towards our prized project of making Dominica the world's premier climate resistant country, it certainly is incumbent of us, its citizens, to ensure the reality of this objective. Nevertheless any attained measure of success towards this goal would inevitably be depreciated without a correspondent endeavor towards cultivating a national resilience in civility, morals, character and behavior - supportive pillars for sustainable progress and development in any nation. It is both very reassuring and augurs well for the future, that there still remains in Dominica, citizens who strive to uphold the ideals of civility, nobility and patriotism. These and their sterling contributions to nation building, we must always celebrate. But neither that fact nor the apparent return to normalcy should lure us into a stupor of 'memoir poule' as regards the scandalous post-Maria looting scourge and which now warrants some very scrupulous auditing of our moral estate as a nation approaching the significant age of forty. In particular one which, in the preamble to its Constitution, its Coat of Arms and its National Anthem, acknowledges the sovereignty of God. 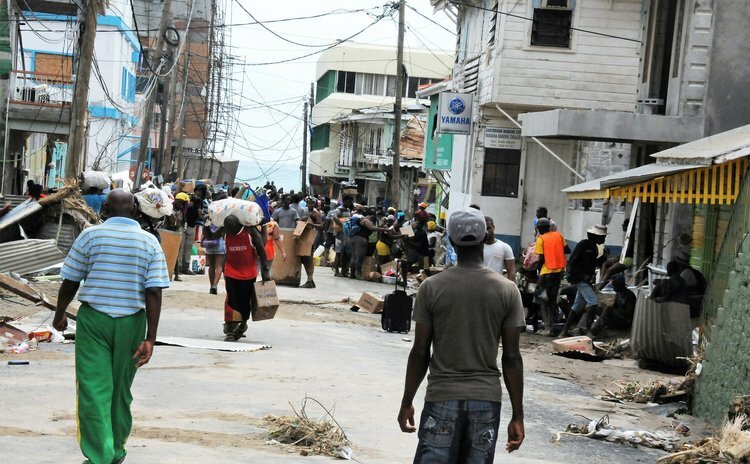 Thus the critical question: what was the driver behind such a wide cross-section of our citizens, many of whom would be classified as decent, cultured, civilized and even religious people, engaging alongside persons they themselves would have rated as being 'below their level' in the aberrant spectacle of looting? Does the 'ignition of the post-disaster survival instinct theory', elucidated by local psychologists on national radio some weeks after Maria, sufficiently explain this? The after-effects of widespread chaos and disruption of normal life after a disaster could understandably evoke great uncertainty and anxiety, thus leading to a desperate frenzy by some to secure items basic to survival. But the occurrence of looting in our nation's history lends little credence to the survival instinct theory as a necessary causative factor. Just six months after Dominica obtained political independence, the government, led by Prime Minister Patrick John, was overthrown in a popular uprising that sparked off on May 29th 1979. Following that event, many businesses owned by known supporters of the regime were rambunctiously sacked. This was the genesis of the looting spirit in Dominica. It was empowered by a passionate malevolence to punish those supporters of the then ousted Patrick John. Is there any record of this having been condemned? Looting was to erupt three months later with the arrival of Hurricane David on August 29th 1979. This was round two for some business owners. On February 17th 2017 the spirit reincarnated when an insurgency of irrationally enraged young men plundered several businesses in the capital after the end of a highly agitated opposition political rally and demonstration. The nation was stunned and condemnation of the madness was vehement. But all these looting episodes put together all paled in comparison to the post-Maria debacle which was the real disaster. The parents who gave their children on-the-job training that night of September 18th 2017 need to know that the evil seeds of theft and pilferage were sown into the next generation. The senior level public and private sector personnel who unabashedly indulged themselves in that inglorious spree must know that they are just common thieves like everyone else who reveled in that mass thievery. To those 'believers' who took psychological comfort in everybody else was doing it, the Spirit of Truth reminds us that "Thou shalt not follow a multitude to do evil". Exodus 23:2. The common meaning given by all dictionaries of the noun 'loot' is something that is stolen or taken by force, or appropriated illegally by violence. The verb 'loot' denotes: to steal things from a place during a war or after destruction by a disaster, fire, rioting, etc. Most Dominicans up till today remain unaware of the extent to which theft and robbery were perpetrated even in some rural areas on private residences across the country. A now resultant detriment from all this to the business community and the economy is the now implemented curfew to be imposed whenever storms do threaten us. In conclusion, Maria laid bare the patheticness of our illusion as a Christian nation as well as the need of redemption from our inherently depraved, sinful nature which was so lucidly expounded on by Messiah in Matthew 15:19, "…For out of the abundance of the heart proceed evil thoughts murders, adulteries, fornication, thefts, …". The good news is that a new beginning as signified by the age forty, of spiritual, moral and socio-economical recovery awaits us as we turn now in genuine repentance to the Lord Jesus Messiah who alone is life eternal (Acts 3:26; Psalm 67). A very peaceful and lovely independence to all and may the Almighty Father bless and protect our beautiful country.